US Defense Secretary Chuck Hagel has toured the Liaoning – China’s first aircraft carrier – at the beginning of a three-day visit to the country. Chuck Hagel, who arrived in the port of Qingdao from Japan, is thought to be the first senior Western official to board the vessel. China bought it from Ukraine in 1998 and has spent 10 years refitting it. 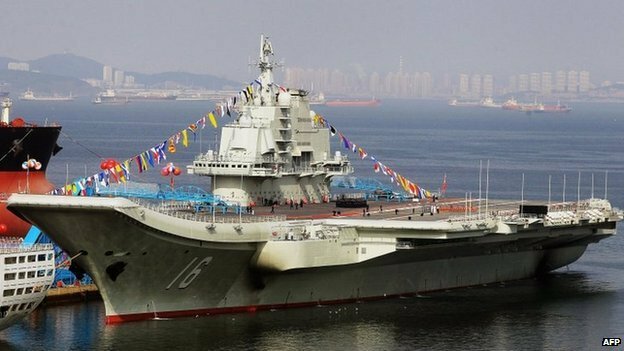 It is seen as a potent symbol of China’s ambition to modernize its navy, amid a strategic shift in the region. The fact that Chuck Hagel was allowed to step on board the carrier will be seen as a sign that the two countries may be willing to engage in more military co-operation. Washington has repeatedly called for more transparency from Beijing on its military spending. US officials said that Chuck Hagel’s visit to the Liaoning at Yuchi naval base – which took place after a US request – lasted about two hours. No further details were immediately available and journalists accompanying him on the China visit did not go with him. The carrier was built in the 1980s for the Soviet navy but was never completed. When the Soviet Union collapsed in 1991, the rusting hull – then called the Varyag – sat in dockyards in Ukraine. A Chinese company with links to China’s People’s Liberation Army (PLA) then bought the Varyag, saying it wanted to turn the vessel into a floating casino in Macau. In 2001, the ship was towed to China. The Chinese military confirmed in June 2011 that it was being refitted to serve as the nation’s first aircraft carrier. Earlier this year, it completed sea trials in the South China Sea, where China has overlapping territorial claims with several South East Asian nations. Beijing’s more assertive stance on this issue in recent years has led to a rise in tensions between China and its neighbors, particularly Vietnam and the Philippines. China is also embroiled in a separate dispute over East China Sea islands that are controlled by Japan. In Tokyo, Chuck Hagel addressed regional territorial disputes, saying Chinese authorities should have “respect for their neighbors”. “You cannot… redefine boundaries and violate territorial integrity and sovereignty of nations by force, coercion and intimidation, whether it’s in small islands in the Pacific or large nations in Europe,” he said. The Liaoning aircraft carrier has already attracted controversy. Late last year, Chuck Hagel criticized China as “irresponsible” after the near-collision of a US warship and a Chinese naval vessel in the South China Sea. The US said its guided missile cruiser, USS Cowpens, was operating in international waters on December 5 when the Chinese vessel – which was accompanying the Liaoning – forced it to take evasive action.